Baked applesauce is about the easiest and best tasting that you have ever made and tasted. If you have never made applesauce using this baking technique, you must give it a try. So much richer in flavor. Baking the apples locks in their delicious flavor! No more mess of cooking your applesauce on the stove top and stirring and stirring. Just cut, season, and bake – what could be easier? Photo and recipe by Ellen Easton 2011 – All Rights Reserved. 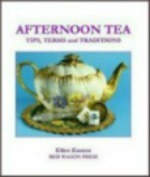 Check out more of Ellen Easton’s Tea Travels™ articles and recipes. In a bowl, mix together the cinnamon, nutmeg, vanilla extract, lemon juice, and honey; set aside. In a large re-sealable plastic bag, place the apple quarters. Add the spice/honey mixture, reseal the bag, and shake to thoroughly coat the apples. Note: To enhance the flavor, you may marinate for several hours in the refrigerator or you may proceed "as is." Place the coated apple quarters on a baking pan or cookie sheet. Bake for approximately 30 to 40 minutes or until tender.The tip of a knife should easily pierce the apple slice. When done, remove the apples from the oven and place in a bowl. Using a potato masher or pronged fork, gently mash the apples to desired texture of either a chunky or a smooth sauce (your choice). If desired, add the optional roasted walnuts and raisins. See below on how to roast walnuts. Place whole or half natural raw walnuts on a cookie sheet and roast for approximately 5 minutes or until lightly toasted. Remove from oven and allow to cool. When the walnuts are cool enough to handle, place on a sheet of wax paper. Using a mallet or the side of a can, roll over walnuts to crush them into small pieces; set aside.